Fantasy roleplaying games allow an escape from reality. They allow us to play out stories with magic, elves, and dragons that could never happen in the real world. Yet they retain elements of the real world, often taking aspects of real world history and cultures to inspire the peoples and societies that populate them. These elements allow the game to retain a certain sense of familiarity, and a certain sense of reality amidst the fantasy. But sometimes, you just want to abandon reality altogether, get rid of the familiar as much as possible, and create something truly different. This can be through travel to other worlds or even other planes. Planar travel has been a mainstay of roleplaying since its earliest days. It’s often something only embarked upon by high-level characters who have acquired the greater powers needed to make the jump from one plane to another, but it doesn’t have to be. The old 2nd Edition Dungeons & Dragons campaign setting, Planescape made PCs natives of other planes and incorporated plane-hopping right from first level. The Pathfinder Campaign Setting first outlined its planar structure in the old Pathfinder Chronicles: Campaign Setting book (later updated as Pathfinder Campaign Setting: The Inner Sea World Guide). The information in that book was later expanded upon in The Great Beyond. But even that book could only provide the barest details. The planes are more than just other worlds; they are entire other universes with enough space in each one to hold millions of entire campaign settings. Planes of Power is a more recent book that takes a much closer look at just four of the many planes that make up the Great Beyond—specifically the Elemental Planes of Air, Earth, Fire, and Water. Of course, this book can still only scratch the surface of these planes, but it is able to provide enough of a backdrop to whet GMs’ creative juices and allow them to expand beyond what’s presented. The book is divided into six chapters, the first of which provides an introduction and overview of the Elemental Planes and their history. It also includes some character options for planar-travelling PCs, including new terrain domains for druids (one for each Elemental Plane), two new archetypes (one for kineticists and the other for rogues), some new barbarian rage powers, a new spell, and a couple new magic items. There is also a sidebar extremely useful for wizards who choose to specialise in an elemental school. Elemental specialists were first introduced in Advanced Player’s Guide, and that book contains a list of wizard spells separated into elemental schools, but few sources published since then have done the same thing, so it can be a lot of work for players of elementalists and their GMs to determine which spells they can cast. This sidebar alleviates a lot of that work. Each of the next four chapters covers one of the Elemental Planes—in alphabetical order, not in order of their relative positions to each other. This is a relatively minor point, but the book also does not reprint the diagram from The Great Beyond and The Inner Sea World Guide showing the relative positions of the planes in the Inner Sphere (the portion of the Great Beyond containing the Elemental Planes as well as the Prime Plane and others). Some locations in the book are described as being near a border (such as the border between the Planes of Water and Earth), but otherwise, Planes of Power contains no description of the planes’ positions with respect to one another and the other planes of the Inner Sphere. It expects readers to already know this information, but even for those who do, it can still be a bit confusing. On several occasions while reading, I had to pull out my copy of The Great Beyond to double-check which planes bordered which (visual memory is not one of my strong points, I’ll admit). It would have been helpful to have the diagram reprinted in this book. I would have still needed to flip pages about, but it would have been easier than switching between books. These four chapters are otherwise well-organised. Each begins with an overview description of the plane plus a sidebar on methods of travel in that plane. After this, there are brief descriptions of the most notable inhabitants of the plane, such as the various kinds of genies, elementals, and mephits, but also other creatures that make their homes there, such as dragons. After this, there is a gazetteer of notable locations on the plane. I should not that there is no map provided for any of these planes. Given that each plane is essentially infinite in size, any such map would have to be so broad and vague as to be completely useless. Instead, the descriptions don’t bother with giving exact locations (other than possibly other locations that they are close to). I will admit that it is a bit of a contradiction to be bothered by a lack of a diagram showing the relative positions of all the planes and not be bothered by the lack of something showing the relative positions of places in each plane, but to me the difference is quite distinct. The number of planes in the Inner Sphere is finite (and relatively small). Showing the way these planes relate to each other is easy and even helpful. Each individual plane, however, potentially has an infinite number of possible locations within it. Leaving the locations of the few described places vague allows GMs to easily insert other locations wherever they wish. After the gazetteer, each plane’s chapter ends with a closer look at one prominent settlement in the plane. For three of the planes, this is the city that is the centre of that plane’s genie civilisation—Armun Kelisk for the djinn of the Plane of Air, the Opaline Vault for the shaitans of the Plane of Earth, and the City of Brass for the efreet of the Plane of Fire. The marids of the Plane of Water don’t have the same kind of plane-spanning empire that the other genies have and thus don’t have a major capital, so instead, the Plane of Water’s chapter presents Vialesk, a city of mostly maridar (a kind of undine). The final chapter of the book is a Bestiary, containing numerous creatures native to the Elemental Planes, including statistics for Ymeri, the Elemental Lord of Fire and self-proclaimed ruler of the Plane of Fire. There is a good variety of creatures for each plane (although air and water get slightly fewer than earth and fire), though I do wish at least one of them was something really, really big. Throughout the book, there are mentions of creatures on the Elemental Planes of truly titanic size. City-on-Lure, for example, is a city built on the back of a gigantic fish (named Lure), and there are references to other, even bigger creatures. I really would have loved to have seen statistics for one of these .The two extreme size categories in Pathfinder—Colossal and Fine—are also the least represented (Fine even more so than Colossal). That said, I realise the point of Bestiary creatures is to provide opponents and sometimes allies for the PCs, and most games are not going to put them up against city- or planet-sized creatures. Oh well. As I mentioned earlier, one reason for including other planes in the game is to allow for stories and adventures that are even more fantastical than typical fantasy, and one indication of a good supplement about the planes is how well it creates a sense of this pure fantasy, of something completely alien to human experience. I’ve seen some planar descriptions that make the planes seem little more than other countries with maybe a few unusual aspects to them. Overall, Planes of Power does pretty well in this regard. It describes some great visuals. There’s the aforementioned city on the back of a fish, floating cities, a jellyfish so huge it stretches from nearly the bottom of the Plane of Water to nearly the top, and a trio of star-like spheres on the Plane of Water that burn so hot that even the plane’s infinite supply of water cannot quench them. There are more abstract differences as well, such as the Plane of Air’s subjective gravity—gravity is in whichever direction a given individual thinks it’s in, which means that people side-by-side can end up falling in different directions. Of course, most of these things take the familiar and present it in unfamiliar ways, but it still creates visuals and situations that would not be possible on Prime Material Plane worlds like Golarion. There are also a large number of unusual creatures across the Elemental Planes, and we get a glimpse of their societies and cultures. In most case, though, they are very human-like. Sometimes, this works really well. I particularly like the juxtaposition created by krakens (which are massive creatures with very non-human-like bodies) engaging in human-like politicking. But on the whole, I would have liked to see more hints at societies that are not human-like at all, particularly the elementals themselves, which a lot of the time only seem to get mentioned in passing. One notable exception, though, is a moot of elder earth elementals that has been going on for over a century. Little details like this go a long way to making elementals seem truly alien. 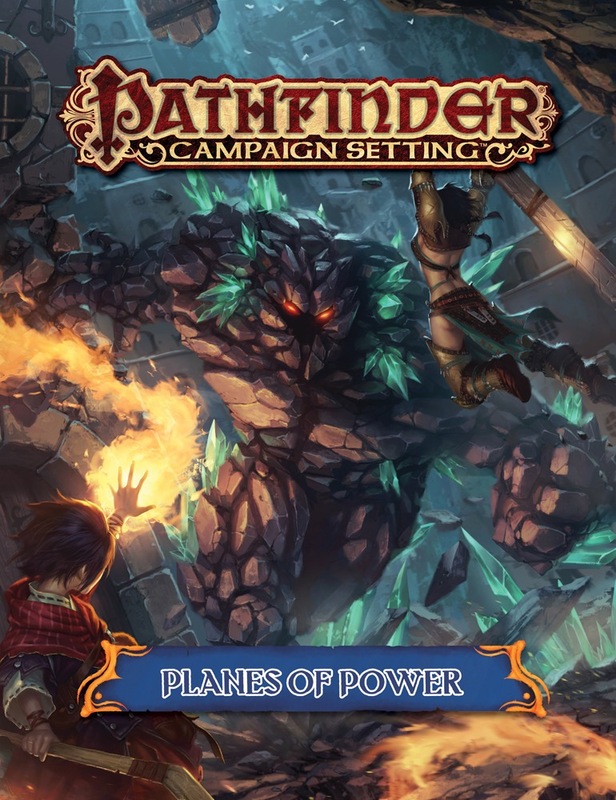 Regardless, Planes of Power is a great introduction for designing adventures set on the Elemental Planes. Indeed, there’s enough information in here to inspire numerous full campaigns. GMs will need to expand on the details and fill in the blanks, but overall, the book is an invaluable resource to get them started.